Here's the 2nd part of the quick walkthrough guide and tips for the Android and iOS mobile game Hungry Shark World. It will cover XL and above Shark scenarios, notable missions, and locations of sea creatures in the game. You may refer to the Hungry Shark World: Quick Walkthrough and Missions Guide Part 1 for more Missions or similar missions not found on this Part 2 guide. - Info: The XL Sharks boast a 6x Points Multiplier during Gold Rush. - Megamouth is the cheapest among the three (60,000 Gold) and has the best Health pool. - Upgrade Speed to at least 164 and Boost to at least 184, more if you want. - Use it to also locate H-U-N-G-R-Y Letters and Daily Chests. - You may buy any accessories you might like with Gold or Gems (optional). - Next, earn at least 120,000 Gold to 150,000 Gold to buy the next shark. - You can also hunt for Daily Chests to get even more Gold. Refer here: Pacific Islands Map - Daily Chest Locations and here Arctic Ocean Map - Daily Chest Locations. - Unlocked Locations: Pacific Islands and Arctic Oceans ONLY! - Just trigger multiple Gold Rushes, best if you can also activate Mega Rush. Eat 1 Fishing Boat = Located at the left side of the Garbage Dump. Eat 15 Flying Fish = Refer to the example locations below. Eat 7 Lion Fish = Hunt them just below the surface. - If you missed 1 or 2, just move away and come back once the timer reaches 3 to 4 minutes. Eat 25/30 Small Crabs = Hunt them around rocks near the surface (blue and red crabs). Eat 9 Stingrays = Refer to the example locations below. Eat 1 Tube Man = Hunt one on the surface. Eat 5 Turtles around the Island of Heads = Located on top of the left most island, yes those turtles lying around. - You can find them around wide open areas, make sure to clear them all to get the shoal bonus. - Example: Above (3) or at the lower right area (1) of the sunken ship. - Swim just below the surface and around the rocks to find those turtles, extend to the left most section first, then go right until you are able to complete this task. - Move without using boosts, unless needed, if you see a turtle, stop and let your pets get them. - It is also ok to use L Sharks instead, if your XL Shark are way too big for this. - Located at the top left most area of the map, the island with turtles, parrots, and humans. - From the drop point, move there directly and conserve your food to survive longer. - If you leave, you'll get a message "Leaving Mission Area! ", so if you see that, quickly move back. - Accessories with -% Health Drain, +% Health or +% Food Bonus greatly helps. - Go directly in there, then only eat fish if you need to restore Health. - Trigger multiple Gold Rush, Mega Rush, and HUNGRY MODE. - On the lower right area of tha map, you can find Megamouths and lots of Blob Fish. Trigger Gold Rush and move upwards. - Below the sunken ship, you can find a group of Blob Fish (left side image). - Go deeper and swim against the tide to find another one (right side image), move and follow the underground current to the left side to find even more Blob Fish. Ride the next underground current to the left then swim against the tide to reach the lower left area of the map. - The lower left side corner of the map contains lots of "double headed" sharks, trigger Gold Rush here and move upwards. Eat 10 Blob Fish = Refer to the "Earn Score" mission above for the locations. Eat 25 Blue Jellyfish = Can be found almost everywhere. - From the drop point, jump directly on the flat surface on the right side, continue until you reach the thin ice. Do no use boost, just continue and eat those penguins. - They randomly pop out in the open, check around corners or underwater caves, bottom areas, Blob Fish locations (best), and more. Eat 25 Humans = Hunt them around the surface, or under the sea. - Divers can be found near the surface, around the sunken ship, and at the top left area of the map. Eat 3 Megamouth Sharks = Located at the lower right area of the map. Eat 6 Narwhal = Located just below the surface. Eat 15 Patagonian Toothfish = Refer to the example locations below. Eat 10 Sharks = Just go around the mid level of the map to find Blue Sharks and Bull Sharks. - Can be found around the sunken ship and at the top left area of the map. Eat 10 Squids = Refer to the example locations below. Eat 4 Villager Spearthrowers = Same method below. - You can find 1 Spearthrower directly on the left side area from the Drop Point, you need to jump high enough to reach him though. - From the drop point, go directly to the village on the right side to grab 2 Spearthrowers. Move away and wait for the time to reach 3 to 5 minutes, then go back. Luck based, but just keep trying, you'll get there eventually. - If you can't survive the 2nd hunt, get your Gold Rush to almost full or collect HUNGRY Letters then go back to hunt the other 2. Accessories with -% Health Drain, +% Health or +% Food Bonus greatly helps. Eat 9 Villagers = From the drop point, you can get 1 or 2 of them directly on your left, then go to the village on the right side to find more. - Check around rocks, if you see a crab, stop and let your pets get it. - Note: If for some reason your Pets doesn't eat the crabs, skip this mission. Yes, it's a bug, either because they can't detect the crab or a certain crab isn't present around (Arctic Ocean only has the violet crab, maybe it's missing another type of crab - ignore and wait for updates or skip). - As you go, more dangerous creatures will start to appear so be careful. Level up your XL Shark to survive longer (not the upgrades). - If you leave, you'll get a message "Leaving Mission Area! ", so if you see that, quickly move back. Conserve your food and only grab birds (inside and outside the rock) and some fish nearby if you need to replenish Health. Lure those long blue sharks below the rock and eat them within the mission area. Those sharks on the left side is kinda risky though, even when luring them in. 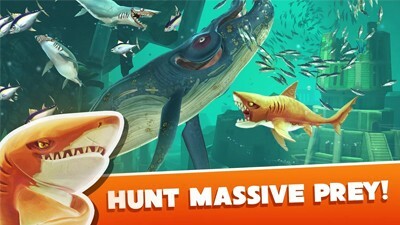 - XL Shark must be at least round Lvl 18, move there fast and enter the mission area with full Health, and without eating any fish around that rock. - You can also go and ride the under water currents located at the bottom area of the map. Activate 12/15 Gold Rushes = Percentage based, just active Gold Rushes. Collect 6 Hungry Letters = Percentage based, just use Basic Map to locate them. Eat 35 Bits of Junk = Can be found below the village area (Arctic Ocean) or Garbage Dump (Pacific Islands). Eat 20 Blob Fish = Percentage based, refer to the Earn Score section above (Pacific Islands). Eat 3 Policemen = Go and hunt them on the surface (Pacific Islands). Eat 35 Seagulls = Go and hunt them above the surface (Pacific Islands - left of the sunken Aircraft Carrier around the Garbage Dump). Eat 15 Small Turtles = Percentage based, can be found near the surface (Pacific Islands). Eat 35 Spider Crabs = Can be found around rocks (Arctic Ocean). Eat 45 Sting Rays = Refer to the example locations below (Pacific Islands). Eat 5 Jet Ski Riders = Percentage based, find them on the open surface (Pacific Islands). Eat 100 Tropical Fish = Hunt them from the Pacific Islands. Earn 1450/1500/1550/1650/1950/2100 Gold during Gold Rushes = Percentage based, just active Gold Rushes. Get 100 shoal bonuses = Clear a group of fish to get a shoal bonus. Pets can really help you here. Swim 19,000m/19,500m/20,000m/22,000m/23,000m = Percentage based, just play normally. *Complete 120 Missions to unlock (!!). *Buy all 3 XXL Sharks to unlock the (!!) Shark! Good Luck and Happy Hunting Guys. Thanks for checking our guide!